The Old Guard at the Sikhote-Alin Reserve in Primorye—the Soviet biologists now dead or retired—were seriously tough individuals. They lived in Ternei before that village could be reached by car; a human enclave besieged by mountain, forest, and sea. Their workplace was true wilderness where, over the years, they endured harrowing experiences as a matter of routine. One biologist recounted how he once killed a charging bear with a hatchet. 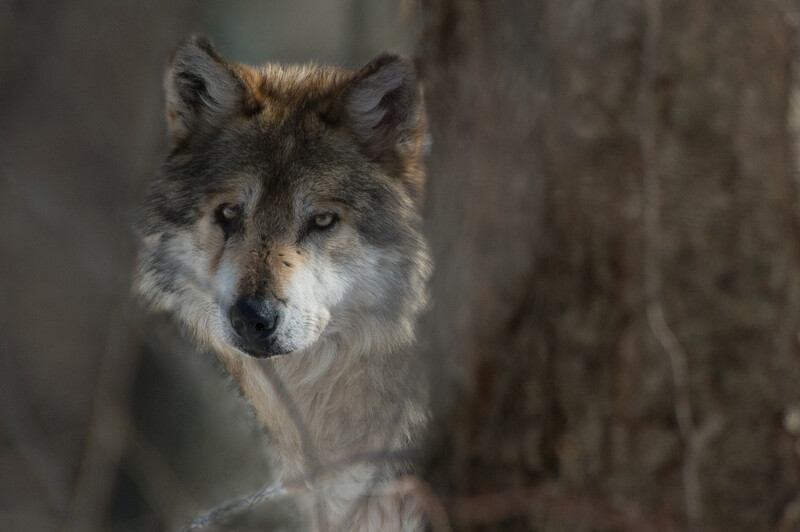 So, when one of the Old Guard began recalling his encounter with a Eurasian wolf decades prior, I sat forward. This was going to be good. It was winter. The fellow was in the forest far from town, and had just wrapped up a long day counting animal tracks in the snow. The winter sun was not long for the sky and, as the tired man trudged east, his eyes caught movement on the tree line then settled on a wolf. Watching him from the understory. A wolf: a thrilling sight! in Russia, forests with tigers are not forests with wolves, and the Sikhote-Alin is prime tiger habitat. Wolves are incredibly rare here. The animal shrunk back into the brush under the biologist’s scrutiny. As the man continued home he looked over his shoulder occasionally to see if the wolf would reappear. And every once in a while he saw it. Always in the distance, always obscured, but always there. The biologist’s heart sunk in concert with the sun. He was still ten kilometers from Ternei, the snow was deep, and it would soon be night. The thought of being alone in a dark forest with a curious predator brought no comfort. He decided his only recourse was to eliminate the threat, and unslung his rifle. When the wolf presented enough of itself for a clear shot the biologist pivoted, aimed, and fired. The beast collapsed dead. The scientist was relieved—his unpleasant death had been averted—but he also felt guilt and didn’t want this rare specimen to go to waste. As penance he resolved to carry the wolf to Ternei where a mammologist from the reserve could study the carcass. He hoisted the large animal over his shoulders and continued the long journey home, a task harder now with the extra weight pushing his skis deeper into the snow. It was well past midnight when the biologist arrived in Ternei. He left the wolf carcass on his porch knowing that the freezing cold would keep the animal preserved, lit a fire in his woodstove, and succumbed to sleep. A persistent banging on the front door woke him the next morning. On the other side he found a local hunter, both enraged and baffled, shouting questions about why the biologist had shot and killed his lost hunting dog, and why he had then gone through the trouble to carry its carcass all the way back to town. The darkness and solitude had tricked the exhausted biologist, he conceded sadly these decades later, into seeing a large dog cast a wolf’s shadow. He recognized now that the animal may have felt as alone as he, and possibly clung to the biologist’s tracks as company home through the forest; this wilderness filled with dangerous beasts. Пора меж волка и собаки, as Pushkin said. (L’heure entre chien et loup).